Coosawattee Resort Lots - Ellijay Land For Sale - Coosawattee River Resort in the North Georgia Mountains. 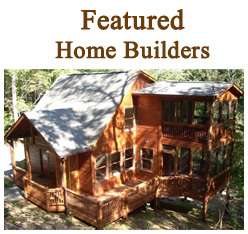 Discount building lots with Owner Financing. 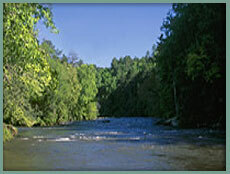 At the Coosawattee River Resort nestled in the North Georgia Mountains in Ellijay, Georgia, we are offering some of our most attractive homesites complete with Owner Financing. In this quaint private, gated community there are many locations from which to choose, including pristine wooded enclaves with Coosawattee River and Mountaintown Creek frontage. 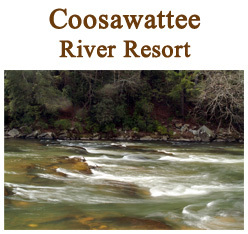 On both Mountaintown Creek and the Coosawattee River just before it enters Carters Lake, the Coosawattee River Resort hosts a variety of amenities from River Parks to indoor and outdoor swimming pools, camp sites, tubing, weight room, game rooms, miniature golf, horse shoe pits, tennis courts, basketball courts and horse back riding. A Combination of the historic charm of this area and a strong sense of community, is why the residents of Coosawattee enjoy either calling Ellijay home, or their home away from home. The mountains of Gilmer County are the canvass for a wealth of outdoor opportunities on land and water. We are surrounded by forests, rivers and streams, Southern ambiance and charm. There is an endless array of recreational activities including the famous Georgia Apple Festival and some of the finest boating on Carters Lake, one of the deepest lakes this side of the Mississippi. The 62 miles of its natural shoreline are pristine, and an active fish stocking program by the Georgia Department of Natural Resources along with the native fish found in the lake provide a diversity for anglers. Fish species include bass (largemouth, smallmouth, hybrid, striped, spotted) crappie, walleye, bream and catfish. Gilmer County is also Georgia's Mountain Biking capital. There are more than 100 miles of single-track mountain biking trails including a 5.6-mile roller coaster of a ride that winds through the Ridgeway Recreation Area. There are riding trails for all levels including the 12-mile ride at Stanley Gap or a slightly technical single-track ride at Bear Creek. If biking is your favorite 2-wheel activity then look no further than Gilmer County. 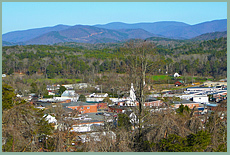 Of course there is always the City of Ellijay in which to relax and to enjoy. Where two rivers, the Ellijay and Cartecay flow together and form the Coosawatee River, this true Mountain Community has its heart firmly centered in its quaint streets lined with charming homes, and a square surrounded by historic buildings, antique, craft, and gift shops and dining establishments, all within a pleasant stroll and filled with warm and friendly people. All these incredible outdoor opportunities come in four distinct seasons and a multitude of reasons why Gilmer County is a nature lover's paradise. Through our website we invite you to experience the warmth and generosity of our people and the magic of this special place. We believe you will discover that Gilmer County is a hidden gem in the foothills of the legendary Appalachian Mountain Range, yet it is just over an hour from metropolitan Atlanta. Come visit with us soon at the Coosawattee River Resort.